Sitting in the tiller cab the tiller operator cannot physically see the tiller wheels. By adding markers on the top of the trailer directly over the tiller axle the tiller operator can see where the tiller wheels are located. The markers provide a visual aid or reference point for the tiller operator allowing them to make decisions on when to make a turn and pivot around obstacles. The tiller wheels sit in front or ahead of the tiller operator. 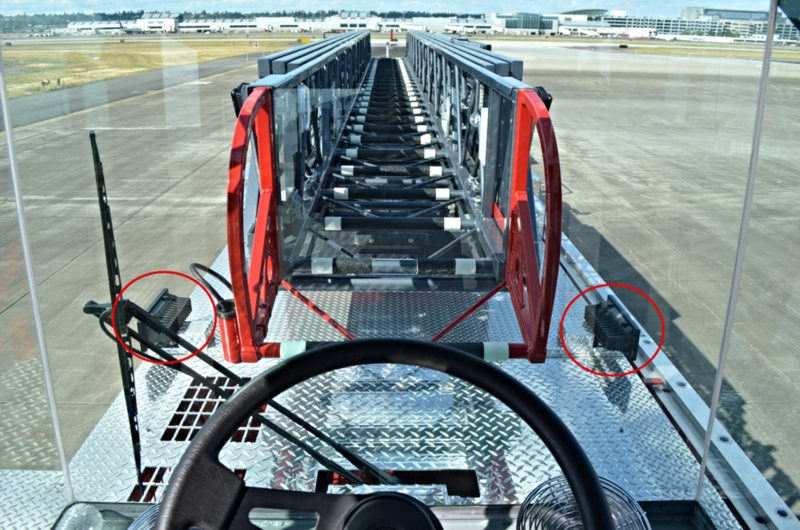 Stop and ask yourself this question “When sitting in the tiller seat, how many feet are the tiller wheels in front of the tiller cab?” Depending on the manufacturer and the length of your apparatus generally the tiller wheels are a good 8 to 10 feet ahead of the tiller seat. 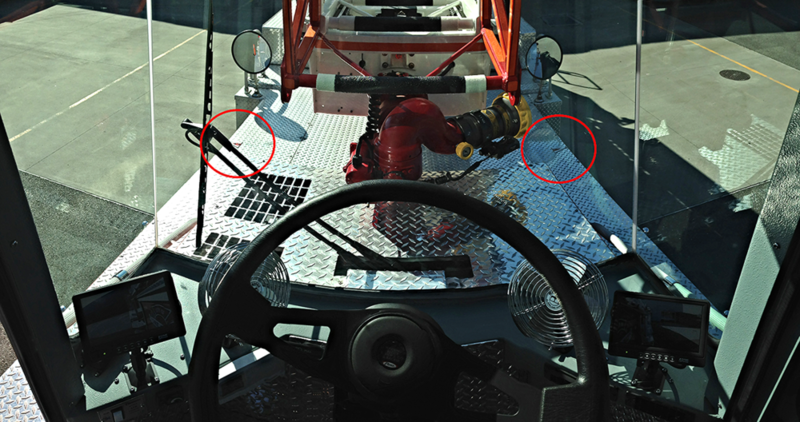 This is information is important, allowing the tiller operator to become more precise in their maneuvering of the trailer. Knowing when to make the correct pivot can only happen if the tiller operator knows the exact location of the tiller wheels. This design option is not standard with most manufacturers and will need to be requested during the spec process. Existing tractor drawn aerials that do not have tiller wheel markers can easily make this modification. There are a variety of different ways to accomplish this function. Departments have become creative when designing markers for the tiller wheels. Here are a couple examples. When we first recommended this with our manufacturer we chose to use the markers that the manufacturer use to line up the turn table. They are extremely easy to retrofit and pose no tripping hazard while walking on the top of the trailer. Brevard County incorporated an amber light into their design giving them the added benefit of seeing the marker at night. Their design also is low-profile and allows you to stand or walk on it. Of course there is more fabrication involved. During the design phase Clackamas Fire District was able to add tiller markers by simply re-positioning their existing scene lights directly over the tiller wheels. 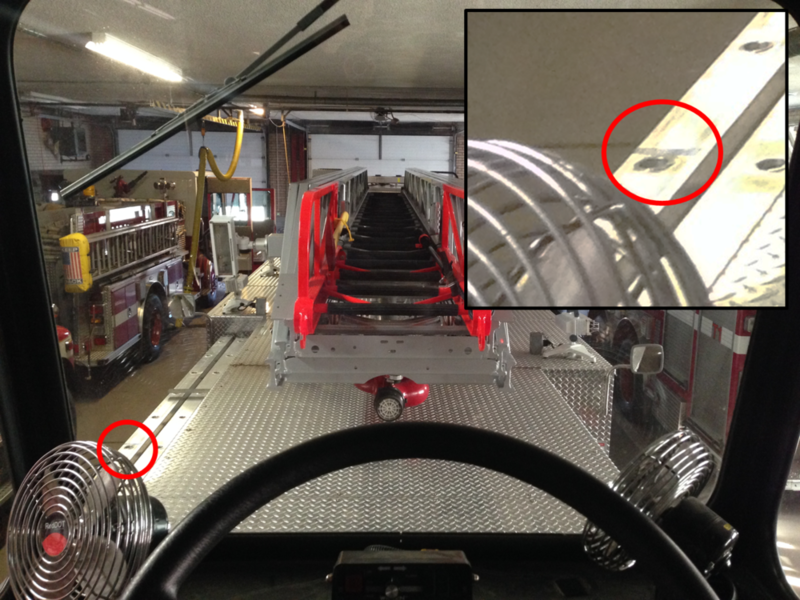 The Meriden fire Department added a piece of blue tape on their ground ladders that is attached to the outside of the trailer on the driver side. The piece of tape is directly over the tiller wheels.